Last night my husband and I were relaxing on the couch and he suddenly says “OK lets go.” I looked and him and inquired where we were headed and he gave me the classic answer “Surprise.” If you have met Zach you know he is a big fan of surprises, from our wedding to a birthday picnic to what he is going to pick up for dinner. I grab my purse and we head to the door Zach steps outside and I hear “Oh crap, it’s raining” I look out the door and it is bright and sunny…and pouring down rain. We did make it to the store although we ended up soaked. While we were wandering around the store and these babies caught my eye. 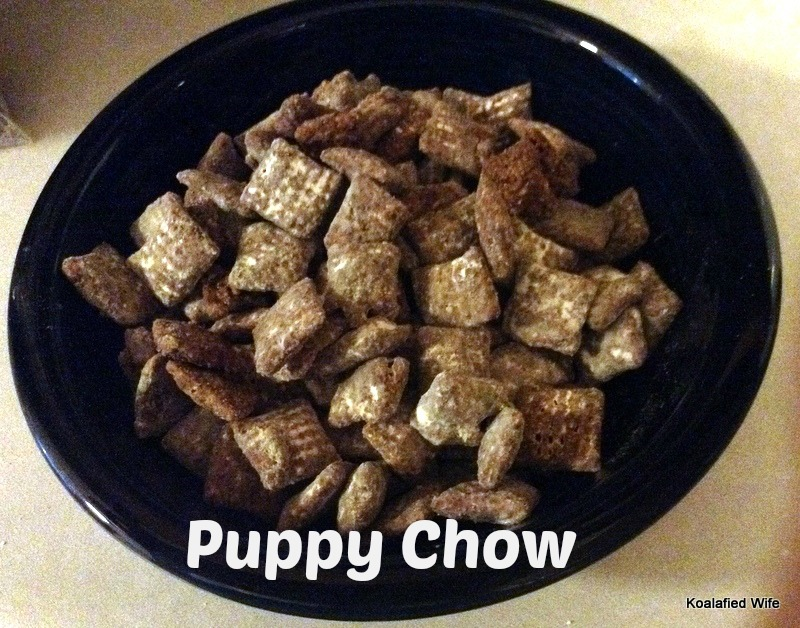 That’s right Brownie Supreme Puppy Chow (I know it says Muddy Buddies but it has always been puppy chow to me). I started drooling almost immediately and Zach, being the good husband he is said he was pretty sure we had to get them, he asked if I wanted the regular ones too. I looked at the small bag and decided I could make a much larger batch for so much cheaper. 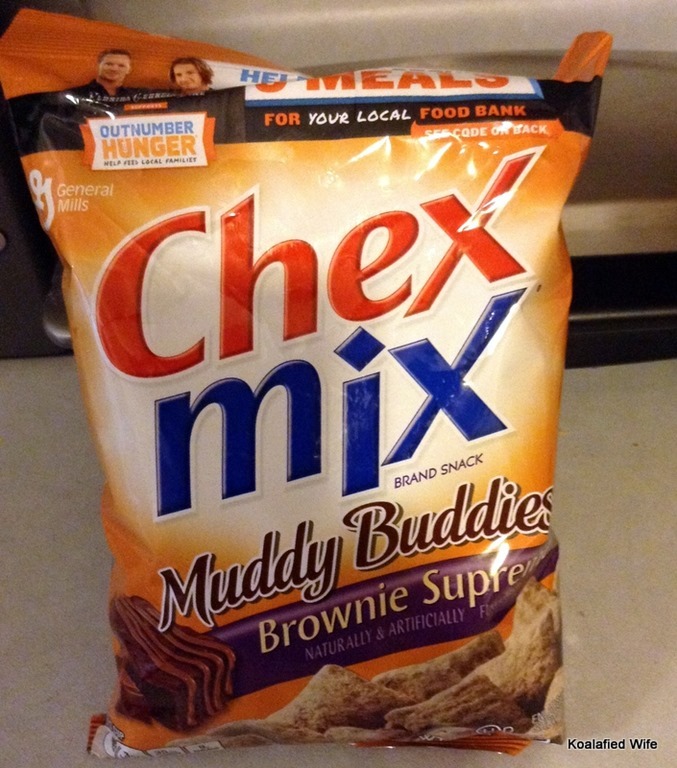 Obviously we had to buy the brownie flavor but we headed to the cereal isle to pick up some Chex cereal. I don’t know about you guys but puppy chow was one of my favorite childhood special treats, I only got it at friends’ houses so I was always so excited for it. Now I am truly lucky because my Mother in law makes puppy chow every Christmas and I always get a big bag because she loves me, Zach usually has to wrestle the bag away from me if he wants any. Since Wednesday was exactly six months until Christmas it had been awhile since I had any so I knew I would definitely be making a batch today. 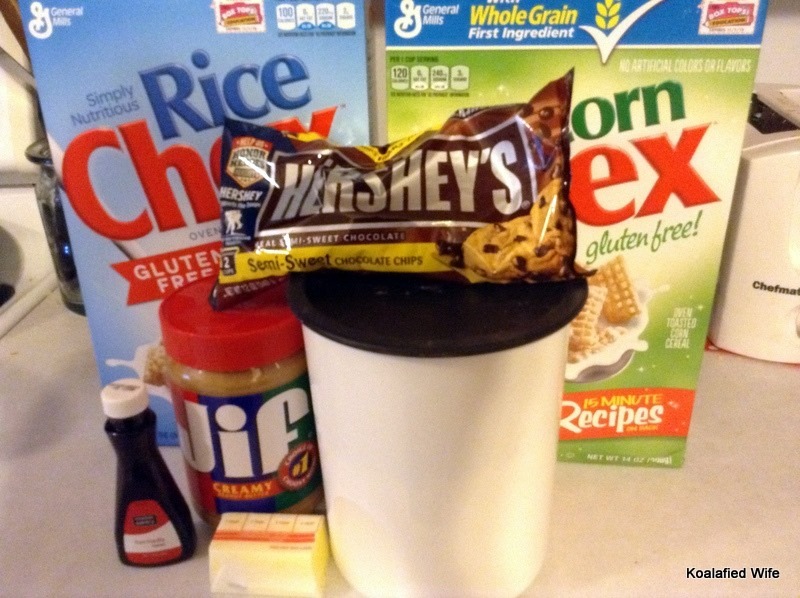 For this recipe you will need Chex cereal, semisweet chocolate chips, peanut butter, butter, vanilla and powdered sugar. 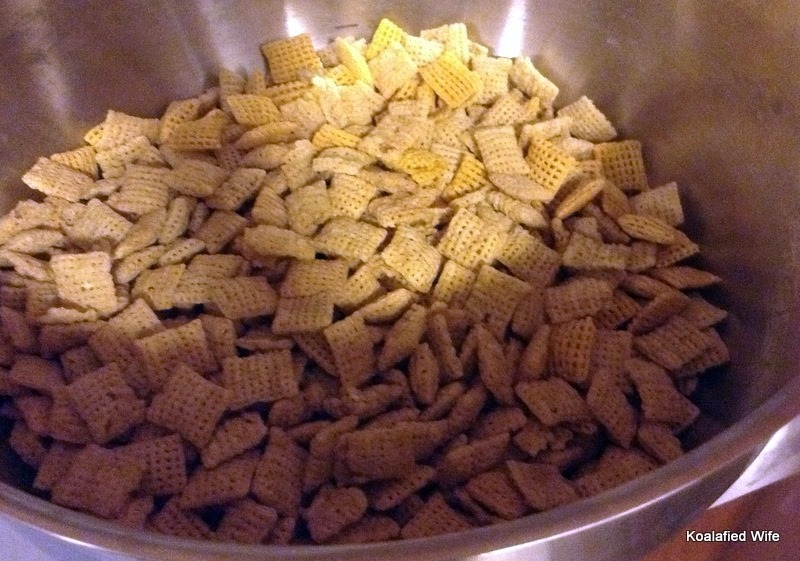 Measure cereal into a large bowl and set aside. I used Rice Chex and Corn Chex. 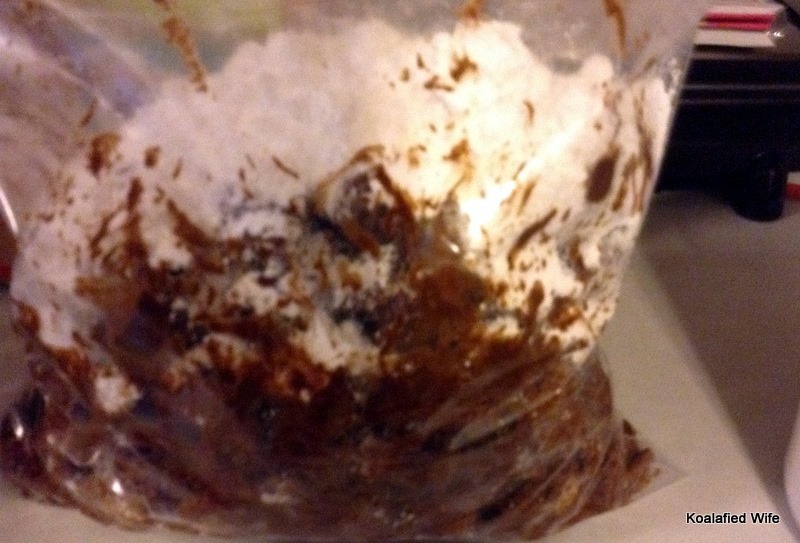 In microwavable bowl, microwave chocolate chips, peanut butter and butter uncovered on high for 1 minute, stir. 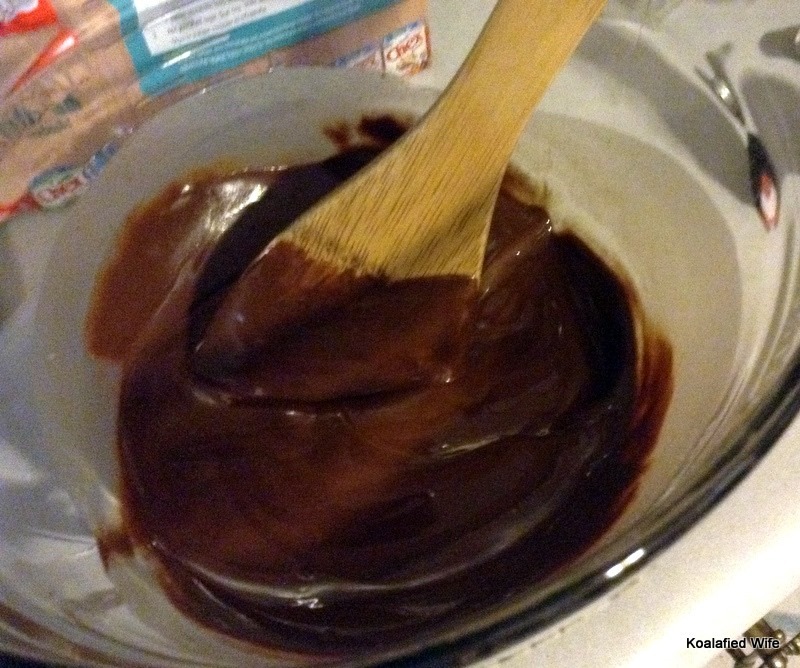 Microwave about 30 seconds longer or until mixture can be stirred smooth. Stir in vanilla. Pour mixture over cereal until evenly coated. Pour into resealable food storage plastic bag. Add powdered sugar. Seal bag and shake until well coated. Spread on waxed paper to cool. Into a large mixing bowl, measure cereal; set aside. 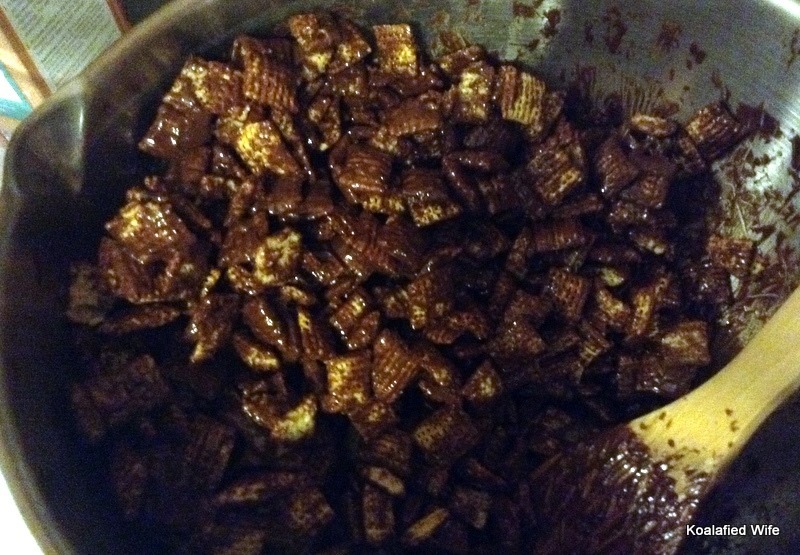 In 1-quart microwavable bowl, microwave chocolate chips, peanut butter and butter uncovered on High for 1 minute, stir. Microwave about 30 seconds longer or until mixture can be stirred smooth. Stir in vanilla. 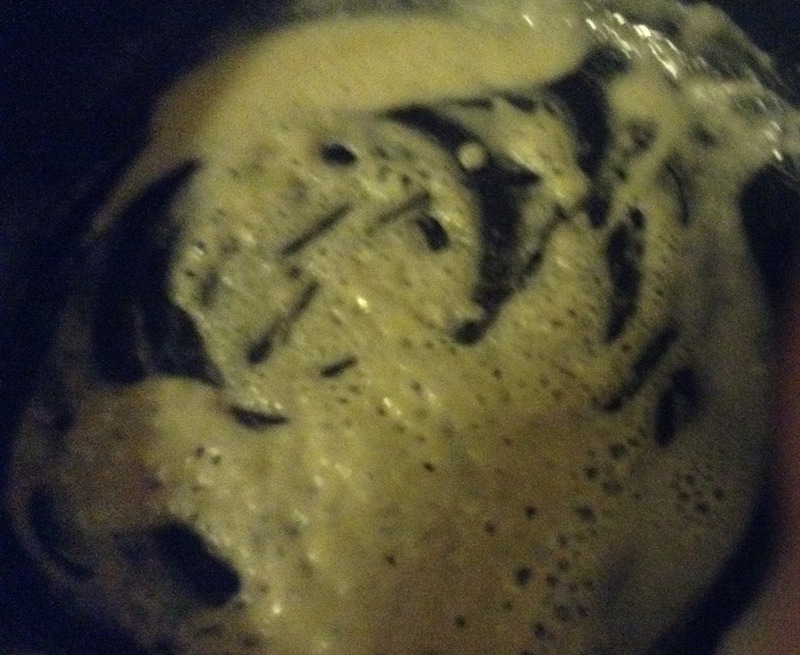 Pour mixture over cereal, stirring until evenly coated. Pour into 2-gallon resealable food-storage plastic bag. 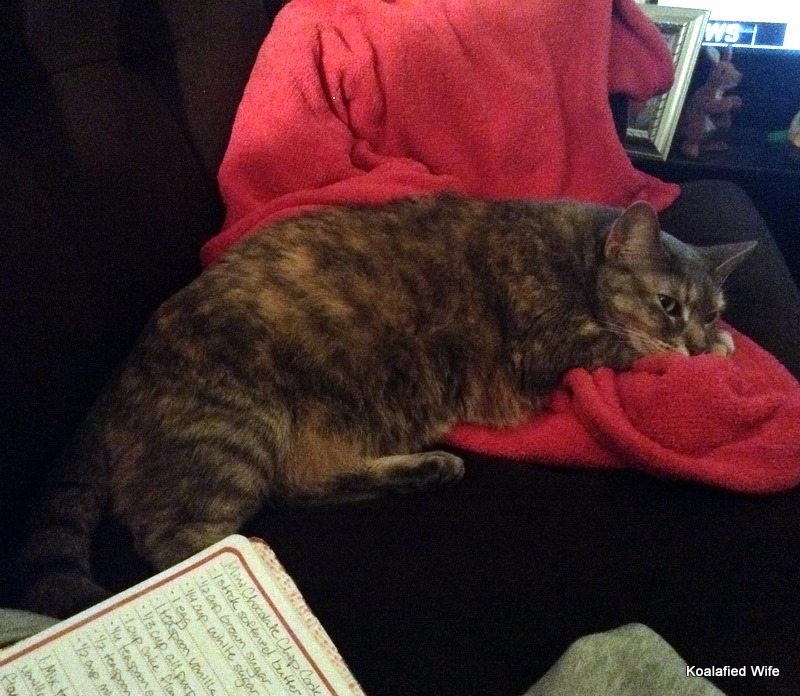 I will leave you with this picture of my adorable kitty….because I love her and she’s my baby! Growing up, what was one of your favorite treats? My Husband has a slight obsession with whiffle ball, seriously, the morning we got married he woke up at 5:30am to get in a few games. He gets together with anywhere from one friend for some one on one, to a whole group. This is serious stuff, they have even made a mound and “players” for the field, and there is even a website with stats. I will admit I have made a few appearances in these games, usually I only play when it is just Zach and I (I am not particularly athletic) but he makes special rules just for me, I know he loves me. Last night I was recruited to play whiffle ball with Zach and two of his friends, Eric and I teamed up against Zach and Seth, we took the name “Team Pink Bat” (because Zach got me a special pink bat for Easter). Team Pink Bat won 9-4! A win like that deserved a special treat! When we got home knew I had to make my favorite meal to celebrate winning! 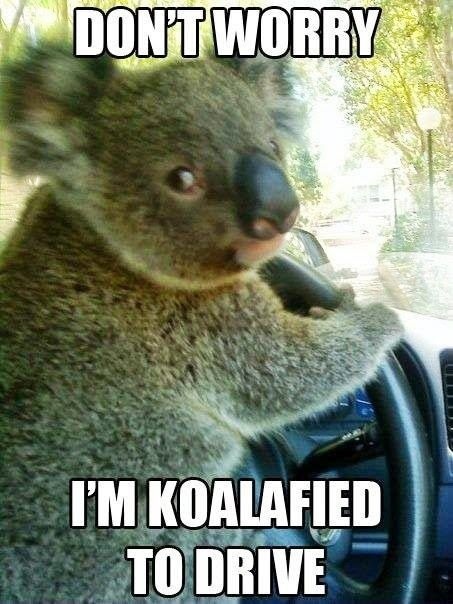 Drum roll please! Mac & Cheese! 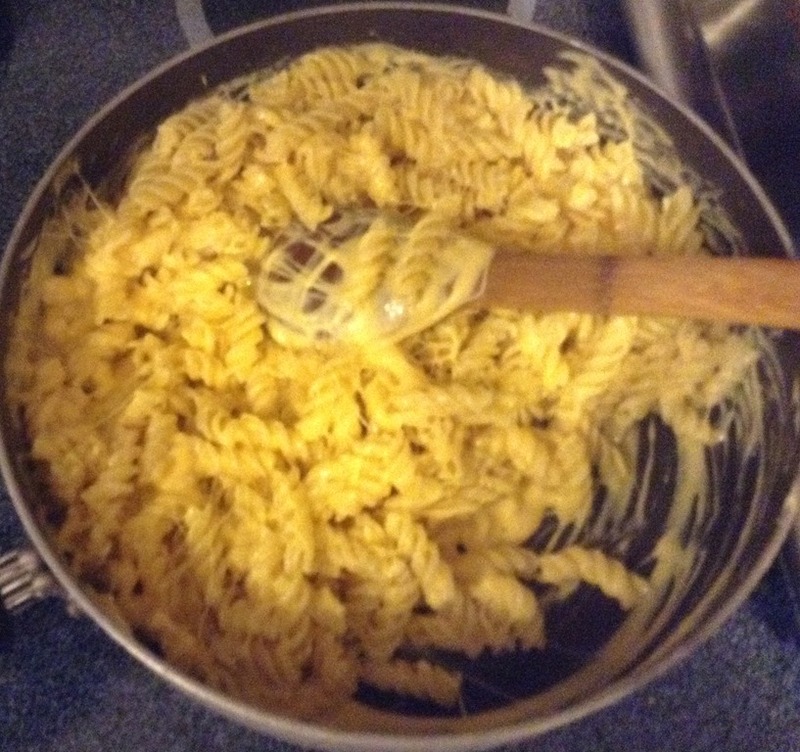 I love cheese and pasta so combine them and I am a happy camper! Boxed mac & cheese has never hit the spot for me, I am a homemade kind of girl. 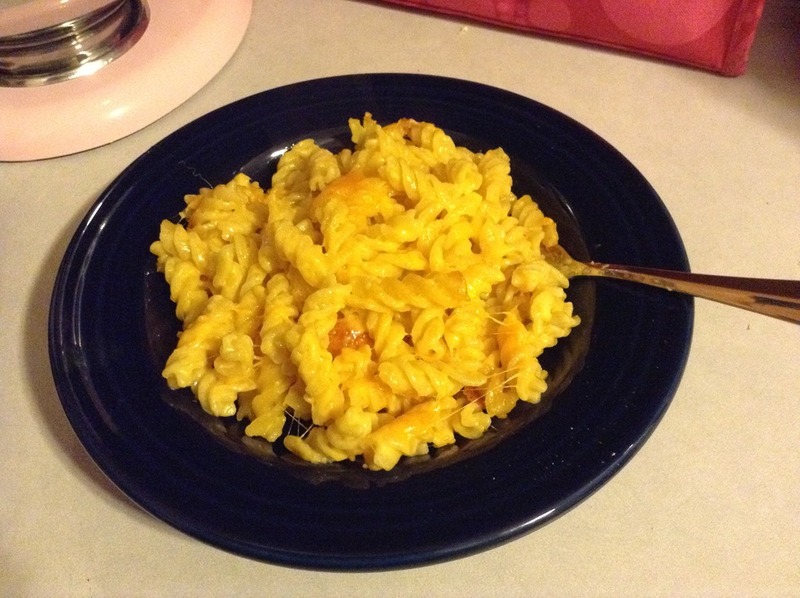 I have tried many recipes thanks to Pinterest but none of them were ever quite what I was looking for until I stumbled across this one on Back on Pointe, of course I had to make a few changes to make it exactly what I wanted but I had found the perfect mac & cheese, I could eat this cheesy goodness everyday! (I am going to apologize now for the photo quality.) The recipe is included at the bottom of this post. Let’s get started! 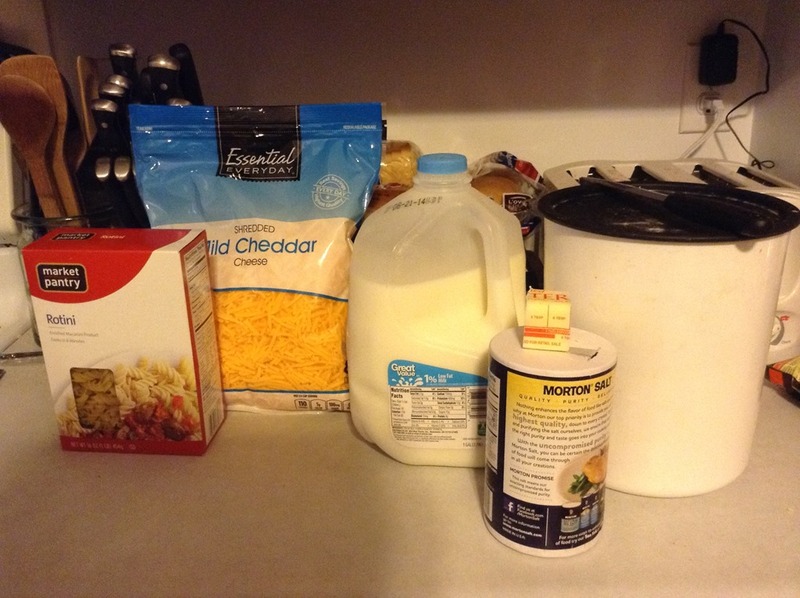 To make my Perfect Mac & Cheese you will need pasta, cheese, butter, flour, salt and milk. First cook the pasta. 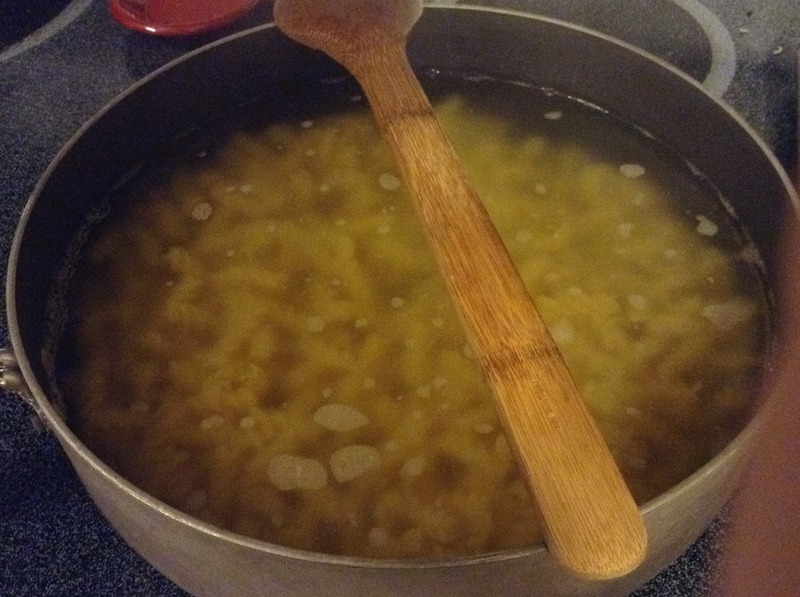 When pasta is done and drained, in the same pot over medium low heat melt butter. Add in milk and let heat for about 1 minute. 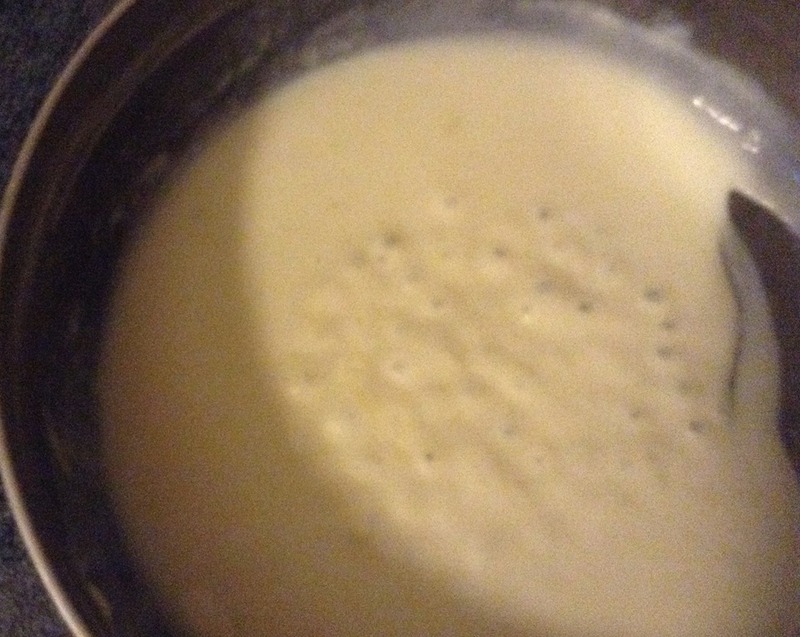 Add cheese, stir for about 2 minutes until it is completely melted and has become a thick, creamy sauce. Add drained pasta into sauce and stir until pasta is evenly coated. Cook pasta. When pasta is done and drained in the same pot over medium low heat melt butter. Mix in flour and salt and stir for about 30 seconds until it is a thick paste. Add in milk and let heat for about 1 minute. 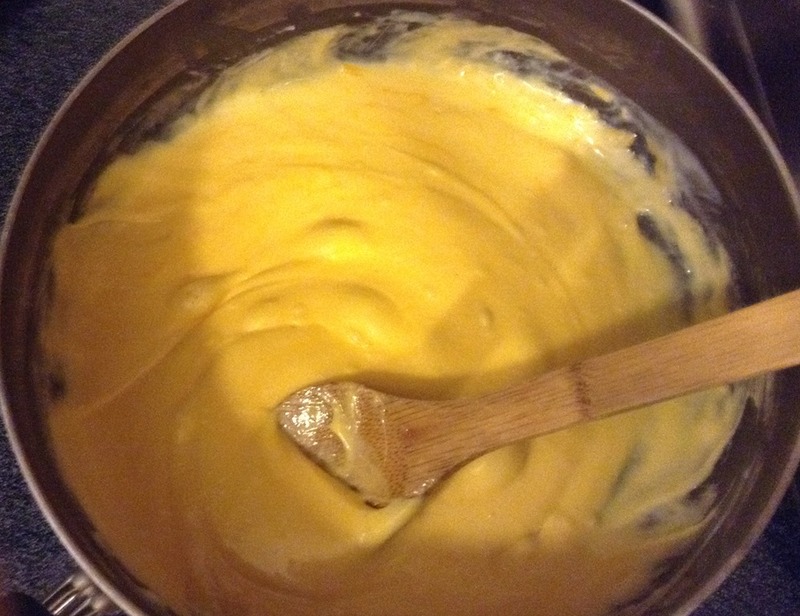 Add in cheese, stir for about 2 minutes until it is completely melted and a thick creamy sauce has formed. Add drained pasta to sauce and mix well until evenly coated. Enjoy! For this recipe you can also pour the cheesy noodles in a greased baking dish, sprinkle with a little more cheese and bake at 350 for 25 -30 minutes. What is one food you could eat all the time and never get sick of? It’s still crazy to me how many people haven’t heard of Nutella or haven’t tried it yet. I LOVE Nutella, I have been eating it for years and go through jars faster than one should (Zach hasn’t tried it yet or we would go through it even faster). I thought I would start off sharing recipes with an easy, delicious and surprisingly healthy recipe. 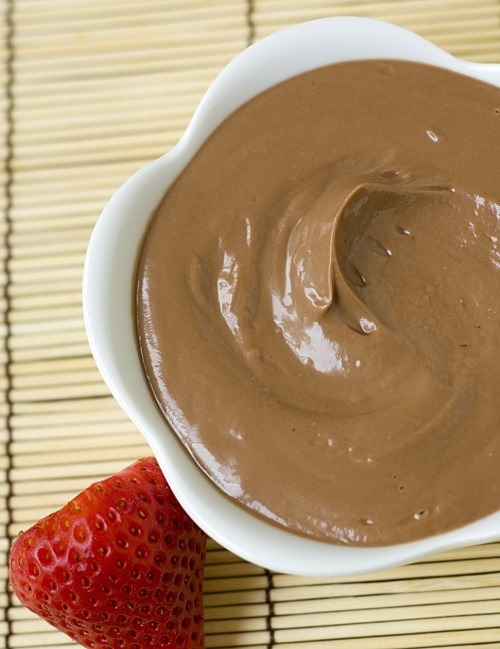 This is my absolute favorite fruit dip, it was one of the first Pinterest recipes I tried. I end up making it for every party and I even have some in my freezer right now to eat like ice cream. I think it has a consistency a little bit like cheesecake, it’s amazing! Easy right? Even people that don’t like Greek yogurt have told me how much they like this dip. 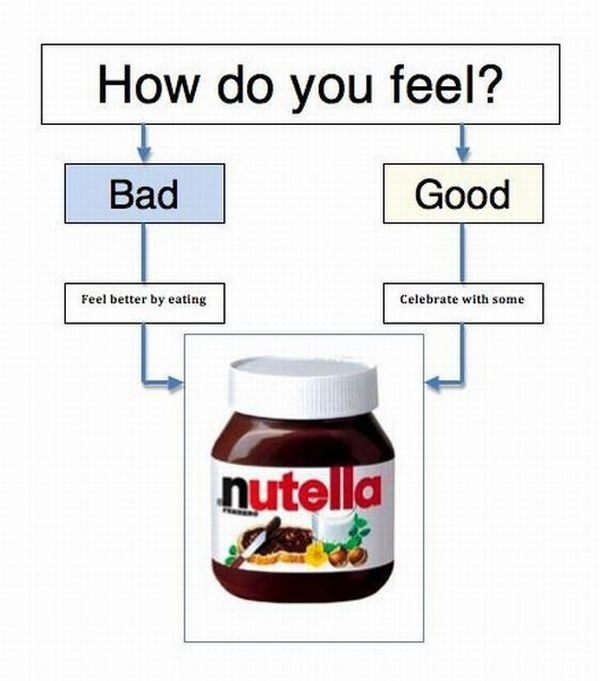 Have you tried Nutella yet? What is your favorite way to eat it?